Twistfix are pleased to announce the arrival of our new radiator reflector panels which are a fantastic innovation and extremely easy to fit. Once implemented the radiator reflector panels will enhance overall energy efficiency within your home, improving comfort levels. Supplied in a kit you will find everything you need for retro-fitting heat reflectors behind fixed radiators. As mentioned they are extremely easy to fit these heat reflective radiator panels and because they have a multi-ridge profile triple action energy efficiency is achieved. As mentioned the radiator reflector panels will reflect any infra-red heat back to the radiator and so the water returns hotter to the boiler which therefore triggers less often and thus this will help your overall efficiency. 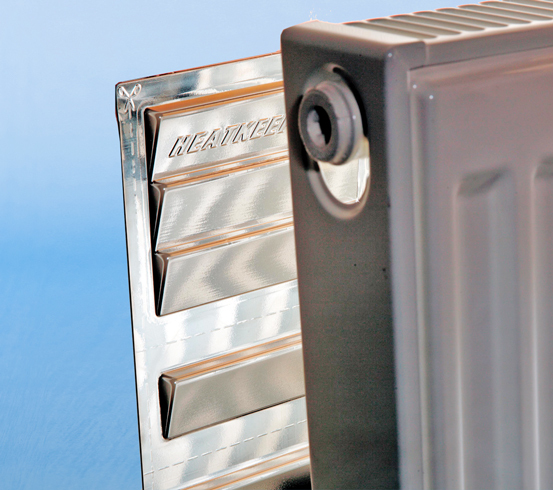 The radiator reflector panels have ridges in them as part of their design and this is so that insulating pockets of air can be trapped between the wall and the radiator. In trapping this air then heat lost through the wall is minimised and this is a common inefficiency of central heating radiators. As the panels are multi-ridged panels they also deflect heat from the radiator which will stimulate and enhance convection currents within a room. When the convection current is stimulated then heat circulation efficiencies and room comfort levels are improved. What Do I Get in the Radiator Reflector Kit? When these radiator reflectors are implemented you can see savings of up to 20% on your heating bill costs and this will mean that total cost recovery through energy-savings in less than one single heating season. These expected savings have been approved by Ofgem under the Carbon Emissions Reduction Target (CERT) programme. 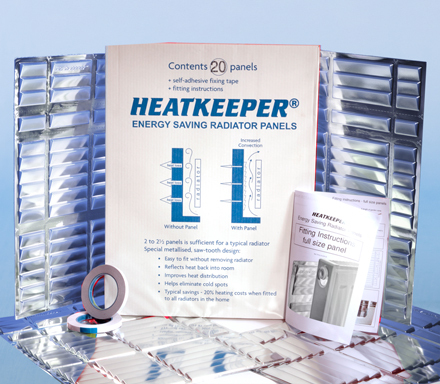 These radiator reflectors form part of our home improvement kits which can be used for DIY and by trade profes­si­onals. Building industry specialists have grouped together the latest materials which can then be used for many modern methods of building repair. For more information on heat reflector foils for radiators call us today on 0845 123 6007 or email sales@twistfix.co.uk.